Well would you believe it, I actually had a response from the Car Parking company! Now you may wonder why I sound so surprised. I'm not sure how it is with all you folks abroad in your respective countries but I'm pretty flabbergasted because I've become accustomed to not receiving responses from companies and indeed many other institutions in the UK. And as for customer service departments - there's more chance of my having a conversation with a purple 6 legged alien with 4 eyes than actually getting to talk to someone who knows their subject. Hmm.....wait a minute. Maybe they thought I was one those nutters who write to newspapers and radio stations and rant about moral injustices? Perhaps they thought I might bomb their offices, go on a starvation diet or even handcuff myself to one of their parking meters in order to bring attention to their hideous plot to milk the middle classes of all their hard earned cash? Not that I would ever, ever do such a thing. Well...not whilst I've got a blog anyway. Besides those pink fluffy handcuffs would look far too silly. And the starvation diet.... well it's a nice idea but um (cough, cough)...not very likely. Although, a bomb I could manage. Easy. I can work wonders with a milk bottle and some Stilton cheese you know. Oh well it's 3.30 am and I'm having another bout of insomnia so I might as well continue. Well you'd hardly know it was summer here due to the appalling weather we've had lately. Nevertheless I've been out and about with the boys. In between parking fines and car crashes we've spent the last 3 weeks at various tennis tournaments and young Ben is on top form having, in the last 2 weeks, picked up 4 tournament wins to add to a whole host he has already won this year. Last year it was Master Jacob's turn to pick up the medals but here they are pictured together just after picking up wins in both their age groups at a tournament earlier in the year. Okay, I'm not saying I've got a problem taking action shots but well after about 500 shots I thought maybe I' better do some stills instead. Anyway, wanna take a guess whose legs they are? And yep those legs are spectacular up close. Beat Venus Williams' anyday. Just a little more definition. This was her cruising to an easy semi final win over somebody (can't remember now - sorry!)... whose legs weren't quite so impressive. Not that I'm jealous of those legs. But nobody, and I mean nobody, mention them again. Okay? 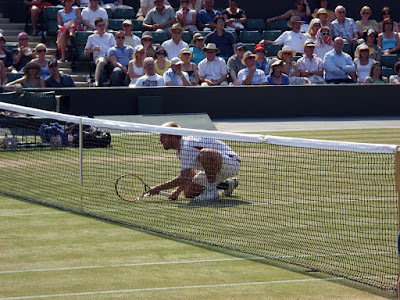 This is the Austrian Oliver Marach taking up what I call the "Get out the ****** way or the ball's gonna hit you on the head" position. I'm sure there's a more technical description but you know I don't actually know it. Maybe just "crouching"? Gez, I shall have to do some investigation (but not at 4 in the morning) in due course. Now this isn't a position you see much in junior tennis - unless you play doubles with Master Ben who has one mean serve. Boy, can he blast 'em down. Believe me, his doubles partner stays well out the way - just in case Master Ben delivers the odd stray ball. Regretfully, I must report Master Ben has quite a developed sense of humor for an 8 year old. In fact, he frequently "dabbles" with the opposition. He lets them win a few points, see a spark of possible victory light in their eyes.... and well then he pulls out what Master Jacob refers to as "The Emergency Serve" and then annihilates them. I mean they can't even get a racket to it! Naturally, young Master Ben inherits his serve from moi which is one of the strengths of my own game. Unfortunately, rather more of my balls tend to go astray. No reason really - I just like hitting Mrs P (Housewife Extraordinaire in Training) on the back of the head. I keep telling her to take up the "crouching" position but she's far too dignified. I just hope she doesn't sue me for brain damage in due course. Oh... 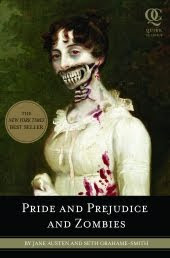 I've just written a book review for Pride and Prejudice and Zombies by Seth Grahame- Smith over at The View From Here. If you want to know about the latest literary craze of Monster Mash pop over and take a look and discover what I think about zombies let loose in Regency England. Hmm...time to hit the sack I think. There I told you a nice letter does the trick!! Indeed it did Mrs M. I wonder if I took that course of redress more often I would get better results - not a pleasant thought really. Congratulations Mrs. T on your splendid stroke of luck/fortune and obviously a big congrats for a well written letter of complaint. What do you plan to do with the the money refunded from the parking ticket--paint multi-coloured stencils on back of car or just splurge on choccies and wine? Not being a tennis fan I must say your composition is spot on :) No nets or bats and just the least argumentative parts of a lady. Hahaha good. They've probably put your letter up on their noticeboard. As I felt in a glorious mood and a trip into town was on the agenda I gave the boys a fiver each and let them go mad in the 99p shop! I'm thinking of stenciling " Beware Mad Woman Driver" on the back of my car though. With the amount of dents it's got already I think people may well believe it! Not bats Roxy - Rackets! Oh you tennis virgins! I told you, you write best in the middle of the night. And a few lady shots as well. Nice legs, I'm all for action shots, especially with a camera! Let's not talk about action shots though - one never knows quite where things may lead to with you! !